Marinas along Dalmatia coast are more and more demanded nautical harbours for numerous owners of yachts, sailing and charter boats. Growing number of charter boats, yachts and luxury sailing boats, during tourist season, are sailing into Adriatic sea for cruise, vacation and introduction of beautiful Dalmatia coast. Producers of these luxury boats are increasing comfort, equipment and accommodation, so they are also named as floating hotels. All of these tourists who are entering Croatian sea, are admiring of our coast and islands beauty, and therefore there are more and more of sailors. After exhausting trip or cruise, all these boats want to sail into Marinas Along Dalmatia Coast so they could find Safe Harbour and supply with all needed and get all other services in marina. There are 6 marinas along Dalmatia coast. They are: Agana in Marina town, Trogir, Kastela, Split, Tucepi and Podgora. Add your object here in one click! By displaying ads you increase the possibility of booking for more than 25%. By placing video footage you enhance the user experience of your apartment, villa, holiday home, motor boat, sailboat, hotel, restaurant, catamaran, rural house, camp or marina you prefer to rent! 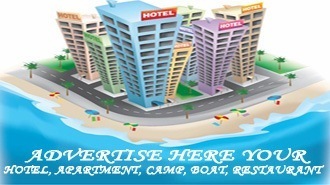 Advertise, send inquiry for video advertising! Hotels, villas, holiday homes, apartments, charter boats, motor boats, sailboats, catamarans, camps, restaurants, rural houses and marinas. Direct web publishing.